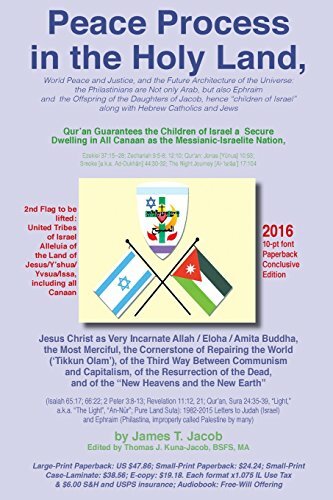 The Philastinians (the "palestinians") are actually the core of the Ten Lost Tribes of Israel -- Ephraim and Manasseh, the "Joseph" tribes -- and so are called to eventually form one nation with the Judahites (Jews), as the Union of Israel Alleluia of the Land of Jesus, incorporating Israel, Philastina and Jordan. This book quotes both Hebrew Scripture's and Islamic Qur'an's agreement on this key point. Moreover, the dispute between Zionism and Arabism, Jews and Philastinians is NOT a racial issue, as these peoples are all of the same Semitic race. It is a theo-political issue within one race, and in particular, within one nation of that race. However, both Jews and Ephraimites (Philastinians) have intermarried with multiple other races and faiths, so both current Israel and current Philastina are multi-racial and multi-confessional societies. Hence the issue between them is also a religious issue. One that can only be solved by agreement between mainstream Judaism and mainstream Islam as to who the Messiah is. Qur'an calls Issa,(Jesus), son of the Immaculate Virgin Mary, the Messiah in at least half a dozen places. Twelve mainstream Rabbis, and the contemporary revival of Protestant-inspired Messianic Judaism and the Catholic-inspired Association of Hebrew Catholics, plus many of the prayers, rituals and customs of practicing Rabbinic Judaism all point -- either directly or subtly -- to Issa (Jesus, YESua, YESHua) as the Cosmic Messiah from sin, death, hell and entropy. And natural science and the five other world religions do, too! Peace and Justice in the Holy Land will lead to peace and justice between nations, races, religions, genders, generations, social classes, and humanity and nature. The author has been devoted to that quest since age five. He is now sixty-five. He brings to this task the Bachelors and the Masters in International Relations, respectively, from Georgetown U. and Johns Hopkins U., and decades of research in religion and the natural and social sciences, as well as decades of back-channel correspondence with world political, religious and media leaders. This book contains many of those letters . Please read this book carefully, and slowly. It is available for discounts of 10% to 100% to certain eligible persons. Please see www.w-e-r-co.com , click the AWPJ Tab, for discount information." If you have any questions about this product by Brand: Peace Works Press, contact us by completing and submitting the form below. If you are looking for a specif part number, please include it with your message.